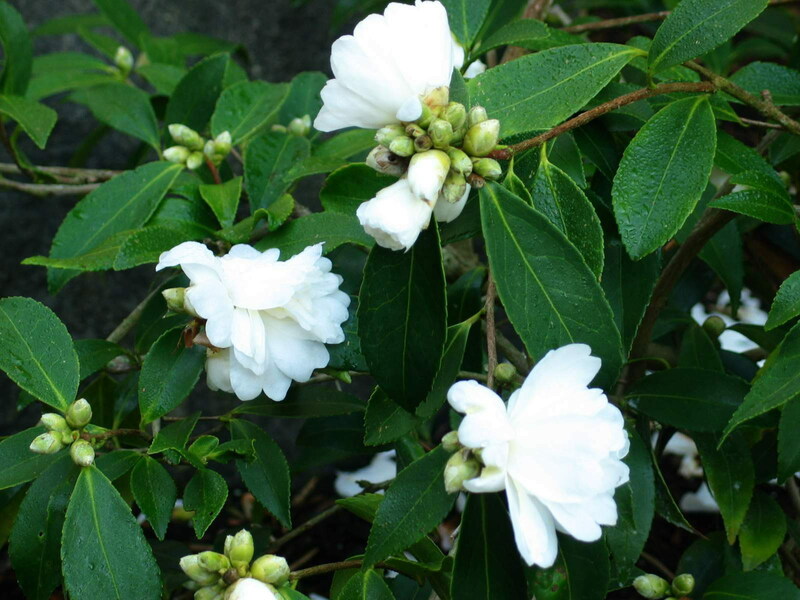 Camellias – The Glory of Winter - Ann Nickerson Landscape Design, Inc.
One of my joys of living in Oregon is the many wonderful broadleaf evergreen shrubs we have that add beauty and interest to our winter gardens. Broadleaf evergreens are those shrubs that have leaves (not needles) that stay on the shrub all year around; such as rhododendrons, azaleas, andromeda, and holly. 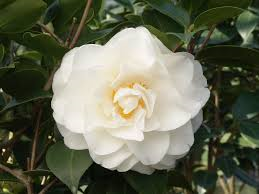 My favorite shrub in this category is the camellia and my favorite camellia is the Sasanqua Camellia; also known as the Winter Flowering Camellia. I love Sasanqua camellias because they bloom lightly all winter long, rather than in one big burst of blooms like their spring flowering Japanese cousins, whose flowers end up in one big, rotting pile on the ground under the shrub after a hard rain. Sasanqua camellia blooms range from snowy white to crimson red, in single and double forms. Even when they aren’t in bloom they are beautiful shrubs. They have shiny dark green leaves that glisten in our wet weather, and are bothered by few pests, so their leaves seldom have that tattered look of some of their more tasty garden mates. Sasanqua Camellias come in weeping and upright forms. I love to use the weeping varieties to pour over a rock in a natural garden or to train on an attractive trellis. Either form can be used as a screen. I’ve placed three ‘Yuletide’ camellias on a series of trellises to separate my client’s garden from their neighbors. The upright forms can make a more natural screen in combination with other shade loving shrubs. 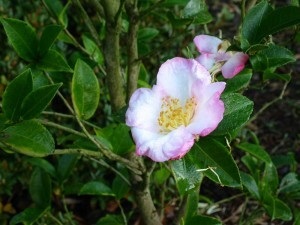 Given a good start, camellias are easy to maintain. Plant them in well draining, slightly acid soil. Our native soil has great Ph. You can improve its ability to drain by adding organic material and mounding the planting area. 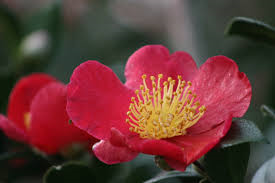 Camellias can take shade to full sun in our mild climate, but don’t place them on a south or west facing side of the house, as they will burn from the reflected heat. I’ve heard they bloom best in part shade. I like placing them in dappled shade where I can view them from a window. Camellias are slow growing, so they won’t need much pruning if they are placed well. If you must prune one, do it just after it finishes blooming. Refrain from turning it into a lollypop. 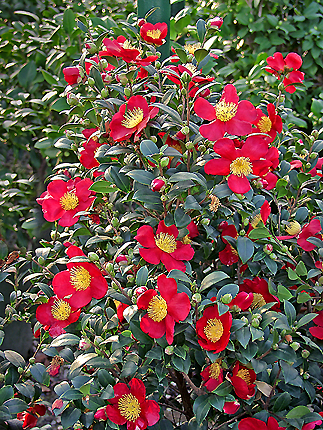 Once a camellia is established, it should only need water once or twice a week. Fertilize them in late fall and again after they have finished blooming. Use fertilizer designated for acid loving plants. I have three favorite varieties. 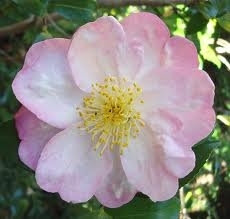 Apple Blossom is a beautiful upright Sasanqua Camellia. It gets 8’ – 10’ tall and has lovely single white flowers with pale pink edges. Yuletide is weeping, with Christmas red single flowers and bright yellow stamens. And White Dove is weeping with snow white double flowers. I use White Dove the most because the flowers stand out so nicely in the winter. There are many other wonderful varieties of Camellia Sasanqua. Head out to your favorite Nursery this month and have a look. They should be in their glory, just waiting to be taken home and adored. Thanks Carla, I just posted again today. I’m trying to post every other Wednesday. We shall see if I can keep it up.